I know the music from Hedwig, but I wouldn't say I totally understood the foundation of the story until I saw the show. I automatically assumed it was just a series of snippets of her life pulled together to tell her story, but the actual final product is so creative and moving, yet hilarious that it took me aback; I fell in love with it even more than I thought I was going to anyway. I want to talk about Darren Criss as Hedwig before we talk about the material because he was the first thing that took me by surprise: Darren isn't playing Hedwig up there, because Darren plays Hedwig so well that I seriously never thought Darren played her until I forced myself to think so for a quick comparison. 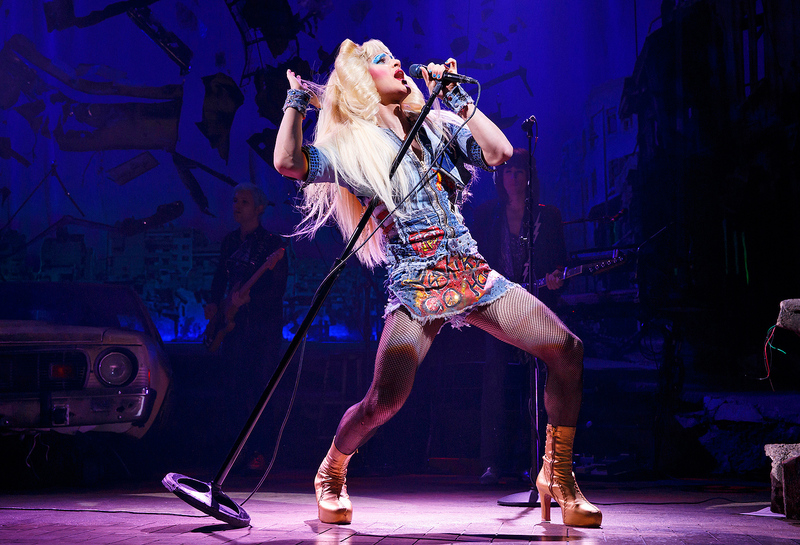 He embodies this troubled German woman with such perfection that he is playing a woman who is in no way a character, but she really is Hedwig up on that stage. It was something phenomenal and something I soon realised I take for granted because it never has such an impact on me at other shows. For those of you that have no idea what Hedwig and the Angry Inch even is, I'll give you a small back story. The show first played off-Broadway in the '90s starring the show's lead creator John Cameron Mitchell as Hedwig. After a very successful run, the show closed and a film version was created that was very different to the stage show but equally a huge success. Over a decade later, the show got its Broadway premiere back in 2014 with Neil Patrick-Harris as the woman herself and the show won Neil a Tony as well as Best Musical Revival and two of the other awards it was nominated for. Since then, this Broadway run has seen Broadway's Andrew Rannells take on the roll as well as Dexter star Michael C. Hall and the original Hedwig himself John Cameron Mitchell; Darren is playing the show until mid-July before Broadway's Taye Diggs takes over. The show itself is presented as though it is a concert of Hedwig's; Hedwig is a performer who is open about her transgender status and shares the story of how she got to where she is right in front of you through short stories and songs. The only other cast member is her on-stage husband and essentially the opposite of a glamorous assistant called Yitzhak who was played by the wonderful Rebecca Naomi Jones (Yitzhak is also a trans character). The story Hedwig tells is a perfect concoction of moving and entertaining with moments where everyone descends into manic laughter, as well as a beautifully moving moment that honestly leaves the entire audience in total silence. The show is a beautiful, moving and entertaining piece of theatre as well as being oddly relatable and incredibly original. If you're a fan of rock musicals or a story that takes you on a journey, consider Hedwig next time you're in NYC or when it comes to London. It's amazing.